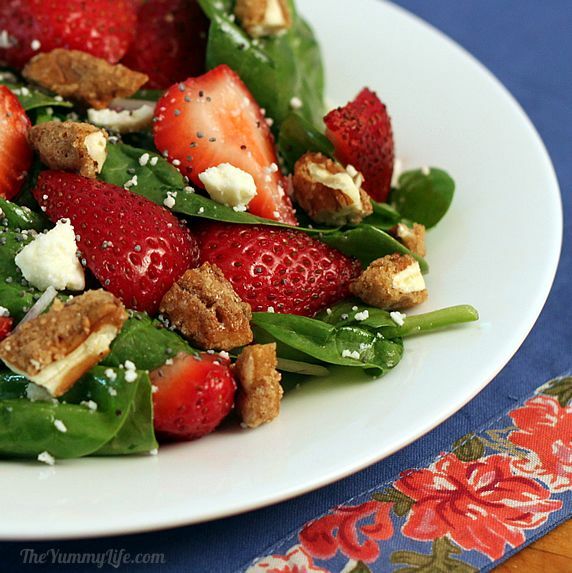 The perfect summer salad--beautiful, refreshing, and delicious! 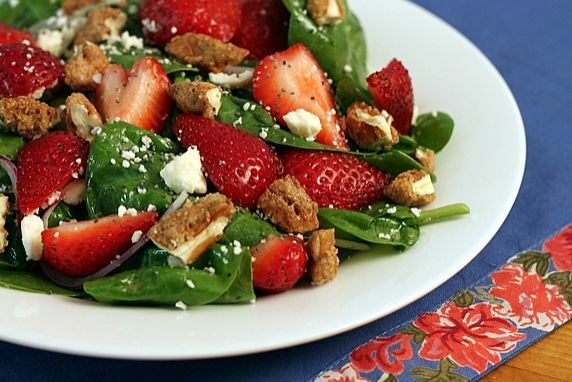 In large bowl, toss spinach, strawberries, onion, and cheese with dressing. Sprinkle candy pecan pieces on top just before serving (so they remain crisp). 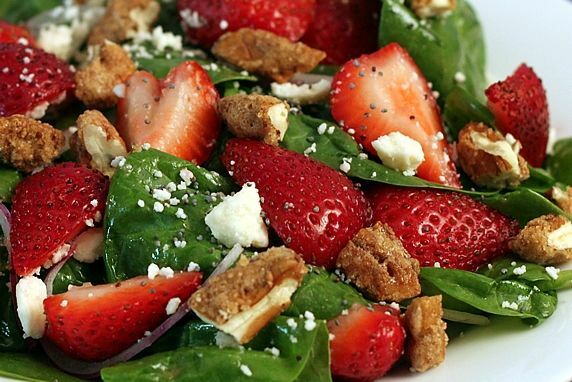 I've had many variations of Spinach Strawberry Salad through the years, and chances are that you have, too. They always have strawberries and spinach, of course. The other ingredients vary widely. Nuts are often included: toasted or candied pecans, walnuts or almonds are most common. Sometimes pine nuts. A variety of cheeses can be mixed in: gorgonzola, blue, feta, parmesan. Sometimes red or green onions make an appearance. Sometimes mandarin oranges show up. Sliced chicken, salmon or shrimp can be added. Numerous dressings are used on this salad as well: simple vinaigrette, balsamic vinaigrette, poppy seed, minty, herbed; the list goes on. Truthfully I've never tasted a combo I didn't like. Today's post is my favorite combination. Today anyway. Another day and with different ingredients on hand, I might choose a different favorite combo. I guess my advice is to use this recipe as a guideline, but feel free to mix up the ingredients. 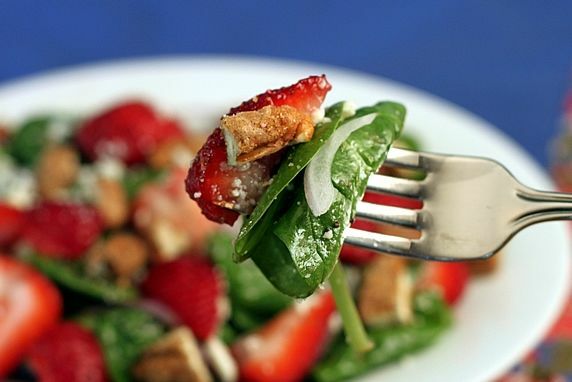 It's hard to go wrong when you start with spinach and strawberries. 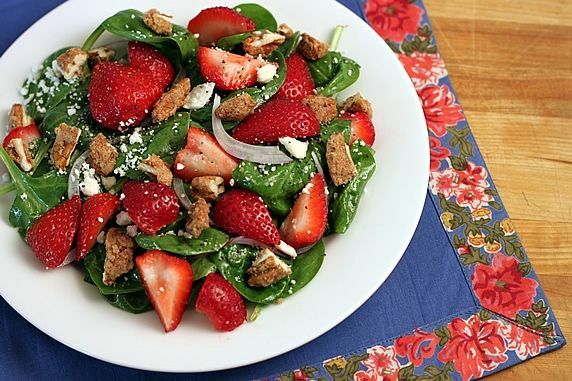 This salad uses recipes from previous posts for making Candied Pecans and Raspberry Poppy Seed Dressing (which uses my Raspberry Vinegar). 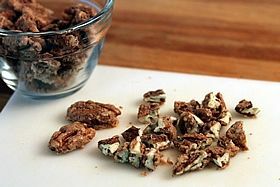 Purchase candied pecans or use my recipe to make your own. Purchase ready-made poppy seed dressing or use my recipe to make your own. Step 2. 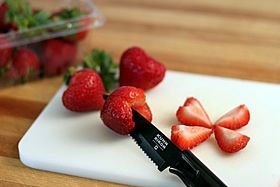 Wash, hull, and quarter the strawberries. Step 3. Break or chop the pecans into pieces--not too small. I broke each candied pecan half into 3 or 4 pieces. Step 4. 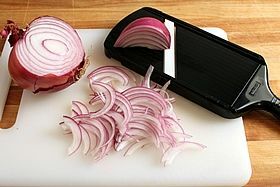 Slice the red onion; make it super thin. I use a mandolin. Step 5. 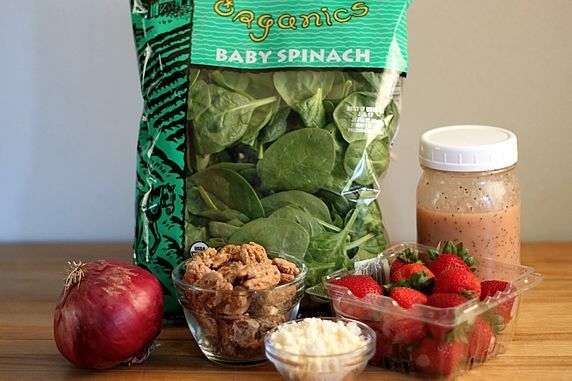 In large bowl, toss the spinach, strawberries, onions, and cheese with dressing. Sprinkle candied pecans on top (they'll stay crispier if they don't get tossed in with the dressing). This flavor combo is delicious and refreshing--it screams summer. And, the colors are so beautiful. My favorite salad. Today. What's your favorite summer salad?